What can you say about Al Arbour? As a defenseman in the N.H.L., Al was born in Sudbury Ontario on November 1-1932 and played with many teams such as Detroit Red Wings, Chicago Black Hawks, Toronto Maple Leafs and the St Louis Blues. During his N.H.L. career, big Al picked up 12 goals, 58 assists along with 626 games played as a defenseman. He received the Eddie Shore Award in the 1964-65 season and the Jack Adams Award for 1978-79. Coaching over 1,600 games, he led the New York Islanders to victory with 4 consecutive Stanley Cup wins from 1980 to 1983 ranking second on the all time coaching list. 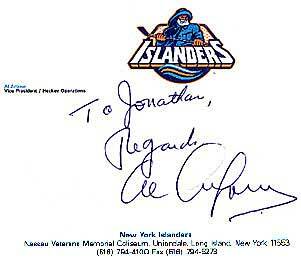 As of 1994, Al Arbour has kept a close association with the club as Vice- President of Hockey Operations.